We left Phoenix and discovered a very nice Safety Rest Stop on Hwy 17 where you can stay overnight, but no camping (tents). 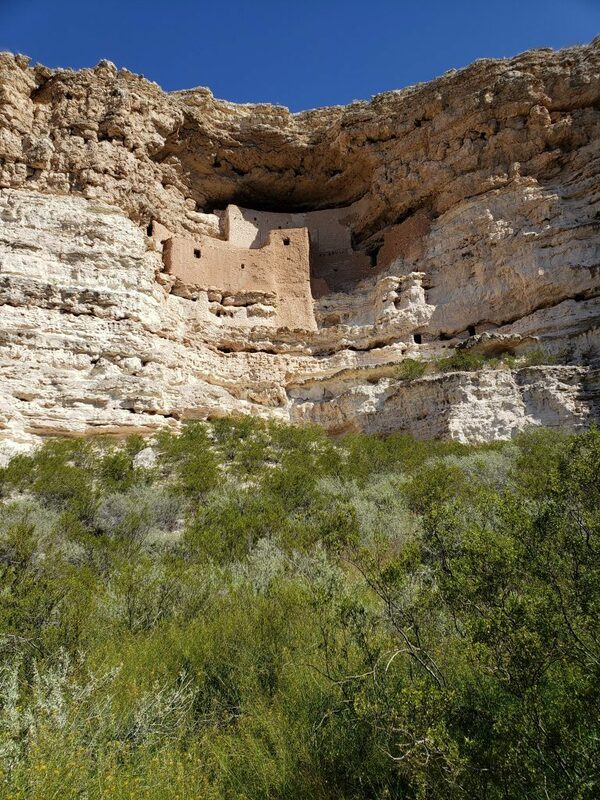 Visited Montezuma’s Castle and Tuzigoot National Monuments. These are both ruins of our nation’s First People. The first is set in a cliff, the second is built on a butte. Both are estimated to be 700+ years old. 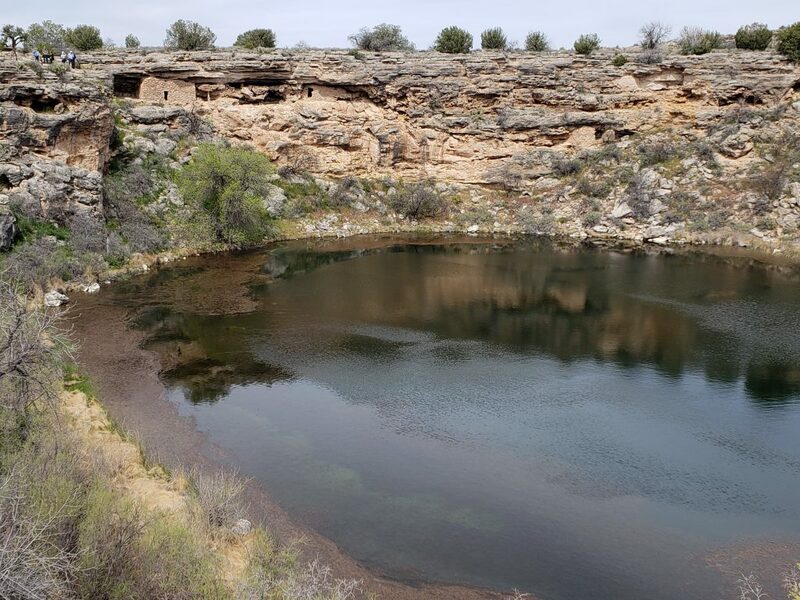 Montezuma’s Well – note the ruins in the side of the well (upper left). After visiting Tuzigoot we drove in to Cottonwood, a cute little town (the old town part) with more wine cafes/shops than anything else. We had sandwiches and old fashioned ice cream shakes at Bing’s Burger Station, then we went for a walk downtown. There is a tiny store called All Things Creative that sells mostly women’s clothes and some men’s hats and boots. I got a beautiful suede satin-lined jacket for $45!! The clerk told me they buy stuff from stores going out of business and then re-sell it. I also got a comfy cardigan for $13. From Cottonwood we drove north toward Sedona, and along the way we drove out on two national forest roads to check out places to boondock, before we continued on to Sedona. The area surrounding Sedona is stunningly beautiful. Red rock mountains, hoodoos, buttes and spires surround the town. We plan to go hike Red Rock State Park. We stopped at the chamber of commerce and picked up some pamphlets, figuring we might stay in the area a few days. We noticed a McDonald’s with the classic golden arches not so golden. 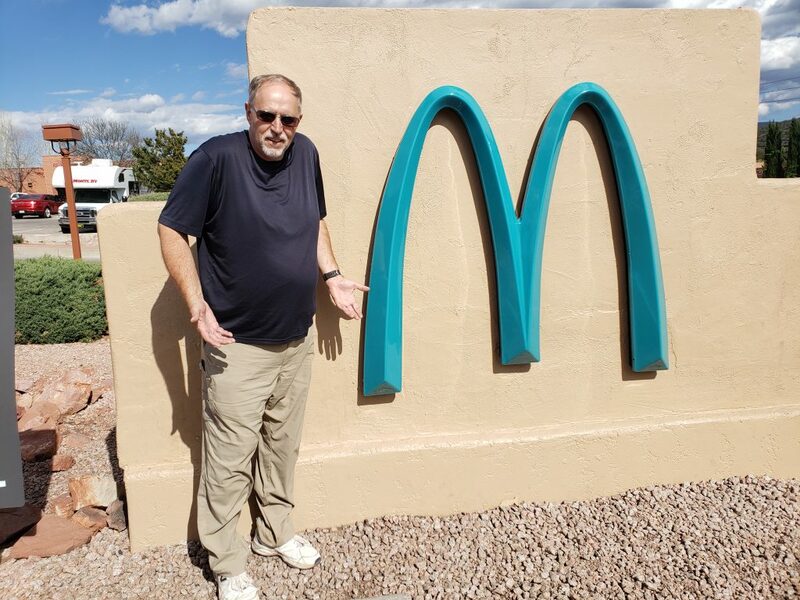 Apparently the town thought that the color was contrary to the “natural” colors in the town, so they demanded that McDonald’s make them a different color. Turquoise was what was agreed upon. Sedona is very, very overrun with tourists. If you decide to go make reservations well in advance. Fortunately for us, we were boondocking well outside of the town.